Dig into New Orleans' mystical side with this 1 hour 45-minute evening ghost tour in The Big Easy. Walk through the haunted French Quarter, learning about some of the city's former residents who never left – ghosts, spirits, and haunts that live in the most unsuspecting places. Meet in the heart of the French Quarter to begin your eerie evening exploration of New Orleans' haunted side. Stop at historical sites where ghosts live now and hear the spine chilling tales of why souls is unrest remain among us. Drink in the history of the city as it’s woven through legendary stories of misfortune, disasters, and disease that have left ghosts and spirits walking among us on our old New Orleans streets. 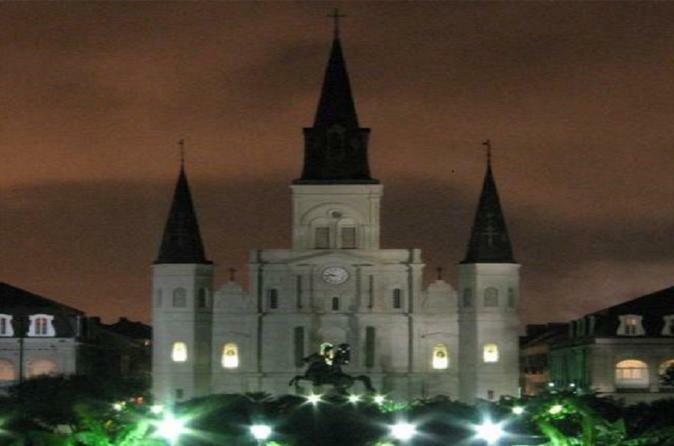 On this haunted tour of New Orleans, hear stories of the historical events and people and see the haunted sites. Learn the events that caused souls to remain among us, including gruesome deeds of the slave owners, and the city’s most infamous and bloodthirsty. These tours are always rooted in history and feature historically accurate storytelling. The ghost tour combines the ancient art of storytelling with historic research and documentation about ghosts and haunting in New Orleans. Unlike a theatrical fantasy tour relying on costumes and camp, this ghost tour draws heavily on the drama of history. See interesting sites that you might otherwise pass without notice and discover their ghostly history.